Sir Robert Fosset’s Circus. © Tim Marshall 1984. BUTTONS: I know Mother. They’ll never find me, behind this nose. Bah! Sei tu forse un uom? Tu se’ Pagliaccio! (Bah! Are you not a man? 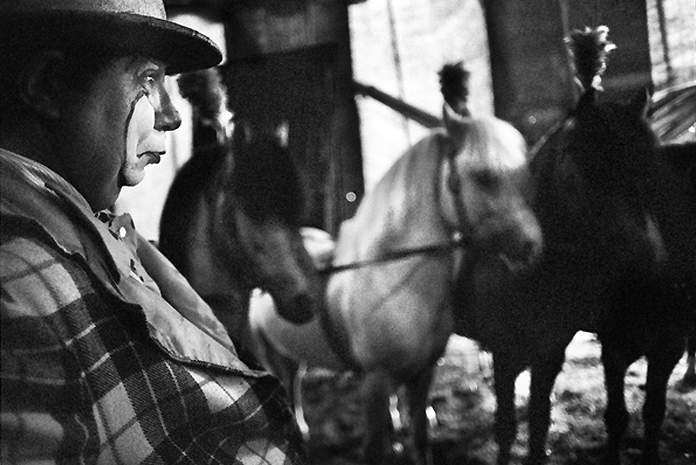 Clowns always make good subjects for photographers – the ‘tragic’ ones, that is, the sad clowns of popular cliché: gentle misfits of the travelling show, forever on the move, ageing into a fragile future. ‘I am Grock’ – that sort of thing. The quintessential clown photo remains Bruce Davidson’s unforgettable image of a dwarf clown in a bleak field somewhere in America. After Waiting for Godot, this image has become a different sort of cliché, foregrounding a forbiddingly grim-faced little clown against a drab urban wasteland. It’s a clown out of Beckett, a vertically-challenged Pagliacci for a nuclear world. Tim Marshall’s clowns are a little more nuanced; for a start, they are full-size, but the gentleman who features in three out of the four pictures in this week’s series has impeccably tragic eyes – like a refugee from a silent film, we feel we know this clown’s backstory: the unfaithful wife, the vanished child, the dying mother … but it’s all conjecture, based on our cultural preconceptions and his amazing face. In a theatre or a circus tent we aren’t guaranteed a close look at the performers’ eyes – but in Tim’s portraits this gent becomes an archetype, as timeless and monumental as Nadar’s study of that ur-clown, Debureau, inspiration for the greatest film about the theatre (perhaps the greatest film about anything anywhere) Les Enfants du Paradis. We don’t have to know what this clown was like as a performer, we don’t need to see him working a Bank Holiday crowd (“the smell of wet knickers and oranges”) to decide whether or not he was any good: Tim’s picture immortalises him as one of the greats. He has the look of tragedy all about him.